Discussion in 'Henshin Justice Unlimited' started by SamuraiEchidna, Mar 19, 2019. All for one dinosaur, and one dinosaur for all! Welcome to the discussion thread for Dinoknight Sentai Ryusoulger, episode 01; "Que Boom!! Ryusoulger". 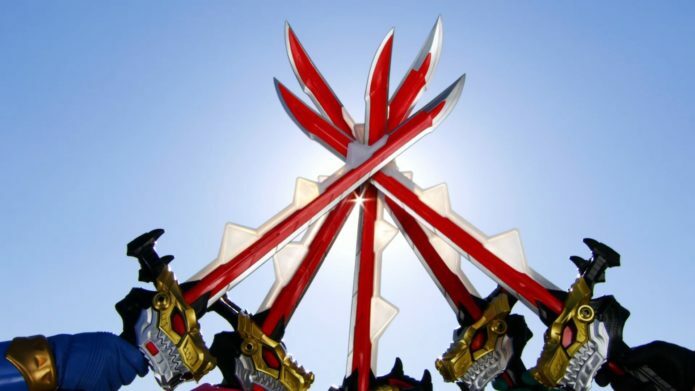 This week: Kou, Melt and Asuna are three members of the Ryusoul tribe who just became Ryusoulgers, but their greatest challenge begins when their sworn enemy, the Druidon Tribe, finally returns to Earth after 65 million years of absence. My, my... Was the first episode So Cool? It was certainly jam-packed. Over-Time translates "Kishiryu" as "Dinoknight". Nothing wrong with that, but in this series, Kishiryu refers to the dinosaur robots and not the rangers. Because of that, I kind of feel like "Knightosaur" would have been a better translation. Makes things a bit more clear, and keeps up the naming convention from other Dino-themed Sentai. Dinosaur, Burstosaur, Voltosaur, Knightosaur... Just makes more sense to me. But whatever, it's not a deal breaker. I guess it never is a good sign when your show starts up around Japan's Suicide Forest. The previous generation of Ryusoulgers died to protect the next generation; but I wish we could have seen the Masters in action first. It's been a while since we've seen older actors playing as heroes instead of young actors. Also, seems counter intuitive for the Ryusoulgers to leave the village. But if they are taking their DinoKnights with them, and if that will draw the MOTW away from their secret village, then I guess it makes sense. but their greatest challenge begins when their sworn enemy, the Druidon Tribe, finally returns to Earth after 65 million years of absence. Haven't seen episode yet, but does series give ANOTHER reason for dinosaurs' extinction? Wow, that had a lot higher production values than I can recall Sentai having for years (if at all) outside of some of the movies. They're really trying with this one. Even the mech cockpit looks like something that cost more money to put together than we've seen for a while. I was impressed with the effort put into the miniature set for the MotW to stomp around in, and indeed the MotW which looks much more old school (or like an Ultra kaiju) than is normal for Sentai (though the Druidon generals do seem more like modern Sentai's style). That beam attack sure does suggest somebody saw Shin Godzilla lol. Loved the non-stock footage transformations, though that bit at the end suggests that we're going to get one for most of the series. I was surprised by the way they killed off the blue and pink masters. While not gory, being vaporized by the giant monster was pretty shocking. It goes with the usual meteor strike, though it does heavily imply that humans were around when it happened. Agreed, though the soundtrack to the actual episode was much better. The Celtic vibe to some of the music really made it seem unique. Also, I enjoyed the visuals to the OP even if the music is meh. On the other hand, I found it very jarring when I got to the end of the episode and it drops straight into into cartoony green-screened stuff. On the other hand, I wish I could be shocked that they killed off the masters, but then I thought of Hyuuga in Gingaman, Magimother in Magiranger, and of course, the Lupirangers' family/friends, so I have no doubt they are alive and well. I'm just getting tired of the killing-off-mentors trope entirely. If the masters really are dead, then props to the show for going all out like that. However, fake or real, it's been done a lot in Sentai. And when you do it too much, especially when the mentors are parents, it starts too feel too much like Disney. Because you know, Diseny's animated movies are also bad about killing off parents for a stronger, emotional subtext, even if that plot point doesn't go very far. Also, I enjoyed the visuals to the OP even if the music is meh. On the other hand, I found it very jarring when I got to the end of the episode and it drops straight into into cartoony green-screened stuff. I can agree with this, especially the ED theme. The music was meh, but the visuals were jarring after that action-packed plot. However, I think the OP theme will grow on me over time. Meh is always better than terrible. And I'm kind of glad to move on from last year's OP theme. Without going into full detail, the OP theme for "LupinRanger VS PatRanger" is kind of a mess. It's a badly done duet that suffers from the curse of can't live with it, can't live without it. So it's nice to finally have a break from it, at least. The opening theme to LvsP was the best thing about the show. I love the duet. LvP Opening was fantastic. Probably the best opening Sentai had in years. Standalone songs weren't that good though, yeah. They did grow on me as time went on. BTW, did anyone else find it weird that the mech has Lego brick looking connectors on it? I can sum up Ryusoulger thus far in one sentence: Gingaman did it better. I do like some of the music (the Scottish-style knight BGM)* and the mecha action is great, and I can detect the "J Drama" style of the writing in some places, but everything else is just unremarkable. The first episode was way too rushed (but that's typical for Sentai) before the commercial break, but got better at the end. I hate how Sentai has gotten so lazy with the "fish out of water" heroes: ever since Goseiger, to be honest, there's just no heart to it. The heroes are in a new or unfamiliar world away from home and it just doesn't matter. Speaking of the mecha though, I hate how TigerLance is the only one other than Tyramigo with an actual body. The rest are just blocks, the dinos stuck in a crouching position. At least with Zyuranger, Triceratops had tank treads to roll with. The Minasaurs are Kamen Rider kaijin from the past few years. Dopants, Yummies, Zodiarts, Phantoms, Roidmudes, etc. *It's clear that they're trying to incorporate some of the original "medival dragon knight" theme. It's still too bad they couldn't do a compromise with dragons based off dinosaurs.